A lot of people would say Windows is on the whole a good operating system, but just about everyone could list something they think is missing or could be improved upon. Moving around the desktop and how the operating systems interacts with open windows is one area that many would agree could definitely be done better. Windows works on the basis that to interact with an open window, it has to be active and the topmost window before you can do anything with it. For instance, to move a window you have to bring it to the front, click on the title bar and then it can be dragged around. It’s similar to resizing the window, you have to position the mouse around the edge of the top most window before clicking and dragging. 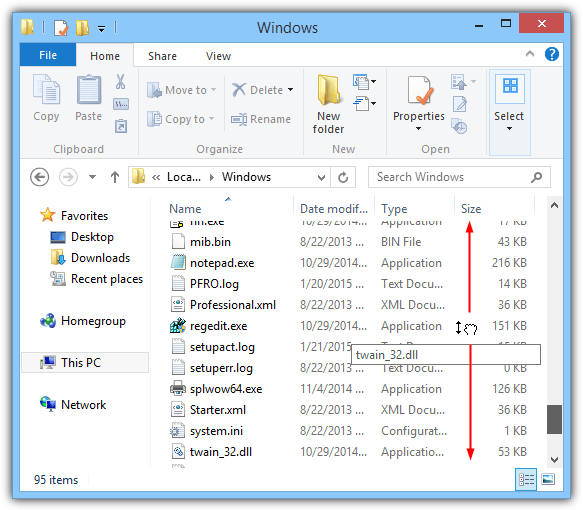 Scrolling with the mouse is also a pain in Windows because you have to click on a window to make it active and bring it to the front before you can scroll the contents up and down or side to side. These things are not ideal and inefficient in a modern multitasking operating system. Other non Windows operating systems such as Linux and Mac OS X can do things like scrolling or moving non active windows without the need to activate them, so why can’t Microsoft Windows? Here we show you 5 tools that can scroll in inactive windows, move inactive windows or both. Flying Windows includes options to scroll in inactive windows and also holding the Alt key down and clicking your mouse anywhere inside a window to drag it. Perhaps what’s a little odd is it also includes a few other features you wouldn’t expect in a tool of this type. 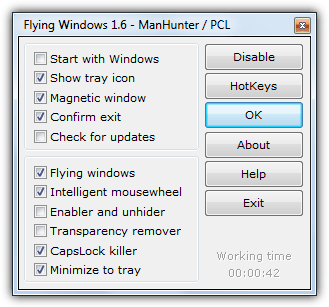 The Flying Windows option is the Alt and drag function and Intelligent Mousewheel is the inactive scroll. Enabler and unhider is a function that attempts to unhide passwords behind asterisks in your programs, while Transparency remover tries to temporarily remove transparency from windows. Capslock killer will turn your Capslock key into a normal Shift key. Flying Windows only consumes about 400KB and is portable but doesn’t work on Windows 8.1 (the others here do) and we found the scrolling function wasn’t 100% reliable. If you’re looking for an alternative to Flying Windows that can move, resize and scroll inactive windows, Always Mouse Wheel is the perfect choice. It’s updated more often and is also compatible with Windows 8/8.1, a version of the program is also included in the DesktopOK icon position saving tool. By default the program forwards just the scroll wheel command or you can also choose to bring the window to the front on scroll. The extra options like dragging with the Alt key or resizing with the Alt key are accessed from the menu which is shown by a hash in the GUI. Another useful feature is changing the system volume level when scrolling on the taskbar. 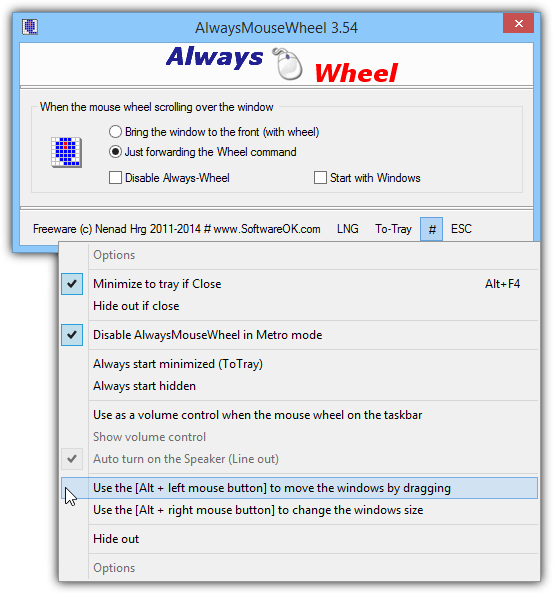 Always Mouse Wheel is portable but can still be started with Windows by ticking the box in the interface. Only about a Megabyte of memory is used while the program is in the tray. KatMouse is a more simple tool and only offers the mouse wheel scroll in a non active window option, but it’s still a useful tool if that’s all you want. Something that KatMouse has that most other tools of this type don’t is a per application custom setting, so if you want to disable the scroll option completely or adjust the speed of the scrolling, you can. You can also do the same with specific windows from the Classes tab. Using the Wheel Button tab windows can be moved up and down the Z order by using any extended buttons on your mouse. KatMouse works on Windows 8.1 but crashes right after you install it, then works fine. 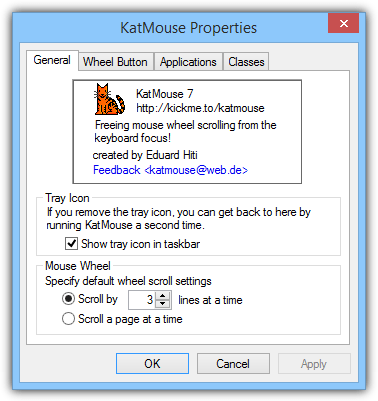 Like KatMouse, MouseImp cannot move or resize windows using special methods and concentrates on scrolling inactive windows. It does however, do this in a different way than the other tools here. To use the scrolling in MouseImp, right click and hold down the button on an active or inactive window and move your mouse up or down. This will scroll things a lot quicker than the wheel does. If you don’t like the reverse scrolling it can be changed in the settings interface, as can the scroll speed and a mode where you just have to click the right mouse button instead of holding it down. This is another utility that offers to scroll in the window under the mouse and not just the active window, it doesn’t offer to move/resize windows. The features are pretty standard with options to reverse the scrolling and bring the scrolling window to the front. Some other options like running as administrator, re-hooking if the mouse capture is lost and enabling support for applications without mouse wheel support could be useful for some users. A portable version is also available. 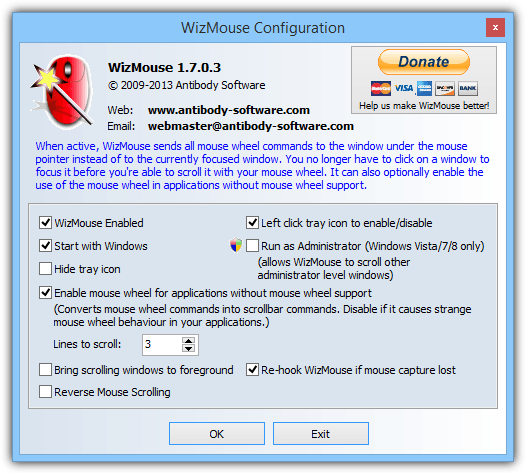 There are other tools available to offer non active window scrolling like Mouse Hunter, Flashwheel and TXMouse but they all do the same thing without much extra in the way of features such as window moving or resizing. I’ve been using Katmouse for many years (since I experimented with linux & its mouse scrolling) & love it. The reason why I’m posting is that I’ve found an app that does the same as Katmouse but it is never mentioned as a Katmouse alternative because it is focused as a ‘Alt’ key window mover (both originally being linux features) it is called ‘KDE Mover-Sizer’ (‘KDE’ is a linux desktop environment). The app does not include its mouse wheel scrolling as a feature & I didnt even know about it though I’ve been using it for almost a year now (I have my taskbar on the top of the screen, linux style, & new windows often appear under the taskbar – this handy little app helps). right click on the SysTray icon > Special features > Enable Mousewheel Scrolling on inactive Windows. Ease of Access Center -> Make the mouse easies tho use -> Active a window by hovering over it with mouse. But that does exactly the opposite of what we are doing here. This article is about scrolling WITHOUT bringing windows to the front and activating them! This wasn’t posted for linux/mac users…. Very very useful tool. thanks. Just want to start by reminding you what a great service you provide to people in the form of free knowledge. Woot….Thanks a lot man…you make my day!